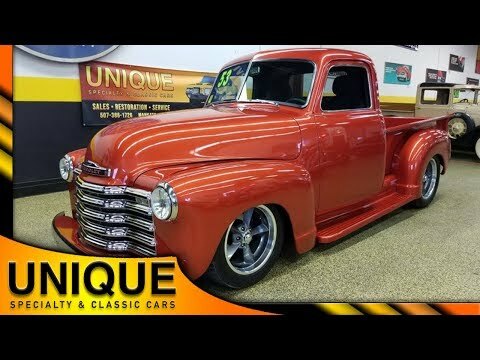 1953 Chevrolet 3100 Pickup Street Rod with not too many miles since it has been finished. Powered by a 350 SBC under the hood which is paired with a 350 automatic transmission. This truck comes equipped with a couple modern amenities including power steering and power brakes. The brightwork and chrome look great and the paint makes it show. This truck is riding on new wheels and rubber. Running board is nice and clean, free of dings and chips. The bed is finished off very nicely with a gas filler in the back to go with the new gas tank. Interior seating is a split bench seat with flip down center console. Headliner was finished in a gray suede, while the rest of the cab was painted gray. Sound deadening carpeting has been installed. The door cards are not completely finished yet, but can be made to be the way you want! Stock dash with updated gauge cluster as well as tilt steering. Custom ignition sequence has been installed. Aftermarket stereo has also been added and has been mounted underneath the dash. Great looking, solid running and driving Chevy street rod!